Other Pieces of Me: A Conversation: So why do YOU blog? I recently got into a rather heated discussion in the comments of a friend's blog about her thoughts on the Carpe Diem post that has not only made its way around the internet, but that has been printed out and handed to me by both my church leaders and by the leaders of a local parenting resource center I am involved with. But back to the heated discussion...I have always considered it a mark of a good friendship if you can disagree but remain friends even if you find it hard to respect the other person's point of view. At the point of writing this, I'm still not sure if my online friendship has endured this latest trial - I'm hoping 'yes', but I have a pit in my stomach that is trying to convince me it is 'no'. Blogging is strange; it is very hard to truly know someone through writing, alone. I will be perfectly honest in stating that my entire life is not available on my blog - nor would it be if you added up my other internet presences - Facebook, Twitter, Pinterest, LinkedIn, etc. When specifically considering what I blog about, my life is more nuanced than my writing is able to capture. Thus, if I am writing specifically about my life, I tend to write for my own need to clarify situations. However, since it is a blog, and since there is a readership, I value the discourse that is afforded to my thoughts and ruminations whether the comments agree with my writings or not (though who are we kidding, I much prefer the former...don't we all?). Here's one thing I am sure of. There are many people, myself included, who find value in online communities. Whether we join in on the conversations or watch from the sidelines, we are automatically entered into the discourse of each blog or message board we read just by our presence. For many of us, especially those of us in the season of parenting, online communities are an additional resource for support in a world that can seem alienating and isolating. So while I want to continue to blog about the benign things in my life that make me smile, the joys and challenges of mothering two children under the age of 3 or even about the existential mini-crises of my days, I also want this blog to become more conversational. I want to know your experiences and your opinions. Even if we as a group or as individuals disagree or potentially go so far as to offend each other with our opinions, even if it is so bad that we just can't come to terms with each other in the comments, I have to hope that were we all to meet in person some day, that we would find we are all civil, caring individuals and we would let bygones be bygones. So, tell me, why do YOU blog? What do you hope to get out of it? Are your readers and commenters part of your consideration when blogging? If not, do they become part of your consideration once the conversation has started? Do you have personal rules of engagement on your blog? And lastly, if you care to share, where is the blogging space you call home? I blog (or as of lately, far more tweeting) because I get to encounter people with interests similar to mine that I don't have in my circle of daily friends. This is especially true for science -- while of course I am friends with my labmates and other individuals in collaborating labs, none of my close circle of friends from either high school or graduate school are scientists. It's an amazing community to bounce ideas off others, get career advice, and figure out what's "normal" advisor abuse and when mine crosses the line. It also allows for friendships between different career groups -- while I certainly have investigators with whom I interact at my institution, I can't consider any to be "friends", or ask personal questions. They're all a good 15-20 years older than I am, and the relationship is absolutely a professional one. However, on Twitter or through blogging, those lines are completely blurred. I have people I consider to be true friends -- those I have met in person, for whom I make hand knit items for their children, who send me dissertation writing care packages -- who are years ahead of me in age and career. The friendships I've made and advice I receive have been so valuable, I honestly feel like I have an advantage over all those others in my position who do not have the entire internet science community at their fingertips. I certainly READ blogs (and comment on them) because I love being exposed to new points of view, especially because all of my real-life friends are very much like me (in terms of class/race/education/life experiences). It's really interesting to learn more about how other people think and do things. As far as blogging myself goes, I don't really write with anyone in mind besides myself. I think of blogging as a way to preserve my thoughts, concerns and general self at that point in time (like a photo album in print I guess? ), so I can look back and see what I was like and what I cared about. One reason I blog anonymously is because I don't want to be concerned with what other people think about what I write, since then my self-portrayal won't be completely genuine. I love having the space to be honest (even offensive perhaps), because in real life I feel compelled to be agreeable and not antagonize people by advocating unpopular or unusual points of view. I do love getting comments and feedback though. It's so gratifying to know that people were interested enough in what you thought to take the time to read it. I find it equally gratifying if they agree or disagree (even when people get angry or insulting: the fact that they had an emotional reaction shows that they took me seriously, which is nice. I don't mind if they think my beliefs/thoughts are wrong.) I do find it depressing when I get feedback which proves they didn't get what I was saying (like they didn't read what I wrote carefully, or that I wrote it badly). My blog is opinionationblog.blogspot.com BTW. I blog because it helps me organize my thoughts and vent, provides SOME sort of structure in my now-crazy life with 2 kids, and helps me share with my readers things I find particularly interesting/funny. (What can I say? Whenever I stumble upon something cool, I want to share it with the world.) Only recently, in the past 6 months, have I added an additional reason to blog, and that is for the money. It's not much, but it really helps me feel more validated when I no longer work full-time, and I can now have some "me" money without feeling guilty about dipping into the family fund. But I try my best not to make money the new focus of my blog, and I know that I would keep blogging even if I didn't make money as I have been doing for more than 10 years. As for how you've started this post, I too agree that a sign of a good friendship is being able to disagree and sometimes even argue for the betterment of each other. That is what love is, isn't it? Love isn't always just lovey-dovey, feel-good sentiments. Sometimes love is pointing out when you believe someone is wrong, and pushing each other to be the best that they can be. And while disagreeing is not necessarily exactly that, a true friend should embrace your differences and not attack each other over them. I too, find much value in online communities but my perspective on them has changed tremendously in the past year. Motherhood is such a hot-button issue because as mothers, whenever we hear/read that someone does things differently, it's easy to feel attacked. It's also so hard to put yourself in the shoes of mothers whose circumstances are different from yours, because motherhood is so encompassing and for many women, it is the largest and most important part of their lives. As such, I have lost some friendships (if they were even friendships in the first place) due to blogging/message board debates. Even if I keep repeating the phrase "Let's just agree to disagree," some women just can't seem to get over these issues and differences in opinion. Additionally, I have discovered that someone I thought I trusted in an online community was talking sh*t about me and my family, and spreading these rumors to other members of this community. I never did confront that person, but I have definitely distanced myself from her considerably, and I have trouble opening myself up to others in this community as well because now, I can't help but wonder, what if she told them these rumors too? Do they believe her? All in all, my trust in online communities has waned tremendously in the past year, and I find myself looking to my real-life friends and family more than ever. This isn't to say that I no longer have online friends (I still consider you to be a good online friend I hope you do too :-) ), but that I am a lot more wary and cautious of who I choose to befriend, and share with online. I have also learned that some friendships are just not worth it, and that in these cases it's better to cut your losses and move on. Sorry for writing an essay in response to your post. I didn't get much sleep last night and my mind can't help rambling! I'm a bit of an inveterate talker. Blah blah blah, just can't help it. It comes from wanting to connect with people and find shared feelings and experiences. This is why I blog - because I just have to get it out. It doesn't matter that I have a readership of about four - I just like to put it out there. I feel a connection with "out there", and selfishly, it lets me get out what *I* want to say without being interrupted or challenged. If that happens in comments, great. But I want to say my piece first. I'm over at http://www.thepalewisconsinite.com. I went to a talk at the Montessori preschool we want Little G to go to all about the Montessori approach and preparing our children for the 21st Century. He was quick to point out that Facebook and Twitter aren't going away, rather they are going to integrated more fully into how we function in the business world in the future. Right now, I consider my blogging and my FB and Twitter identities to be my connection with the world outside the people I work (or used to work) with. On the one hand, social media seems to allow for more collaborative discussions and I can see how that would be ideal in the ever changing business world, but on the other hand, once we hand all of our social media over to full publicity, are we then just living two lives - one in the RW and one online? I feel like your response is something I would have written verbatim a few years ago...back before getting 'outed'. I have since learned the lesson (and I had to learn it three times before it actually hit) that nothing is anonymous on the internet and everything on the internet is written in ink. Of course, if I were are a wildly successful blogger, that might just worked for me. But I'm not, so it doesn't. It reminds me of a friend I know who is supremely funny and tried out some stand-up comedy in college. She ended up hating it because a lot of her humor was impressions of other people and she didn't like how it made her feel. It was one thing to be funny with her friends, another when other people were watching. I do really like your idea that no matter if your commenters agree or disagree, at least they HAD a reaction that they shared. I too find it demoralizing to have written something that means a lot to you to find out that the most passionate responses are written by people who clearly didn't read what I had to say! Yeah, I have to say, my trust is waning too these days. And I never seem to find such original things as you do to post...usually if I see something on your blog, it is the first time I am seeing it. If I were to post stuff I liked, it would all be stuff that everyone had already seen before a thousand times! That's actually the hardest part about my gig with FLOR...coming up with not only new content, but actual new ideas. That's definitely how I felt when I first started blogging! Honestly? I blog because it's fun. I blog to have something to look back on and remember different phases that I've gone through. I blog to stay organized and on track with my life - keep myself in check, at times. I blog because I love to write - whether or not I'm good and it, whether or not anyone is interested in what I have to say. I blog for me, but when I see something or do something that I know readers would enjoy, it gives me even more motivation to sit down and take the time to take the photographs, write, edit it all and post. Because I have gained so much knowledge through other blogs that if even one person gains something from mine, then I feel like all of my work that I put into it is benefitting more than just myself. I choose to keep certain things private, but slip now and again into more personal details - it all depends on my mood. I go back and forth with whether or not it's such a great idea to put myself out there on the Internet, but in the end, I enjoy it so much that it is worth it. Blogging isn't just something I do anymore, it's a real part of my life. I think a hard part about mothering is that it's so personal, but also so public? So you want to say something, worry that whoever it is will be insulted, end up saying it wrong, want to go back and correct it, but then it's just building layers to a big mouthful of words gone wrong. Eventually, you hope to build a thick skin to what people say to you, about you, in regards to you (and your family), and in some ways you do. Then something you say gets taken wrong, or you didn't write it as you had planned, so it looks weird, but then a comment gets you right where it hurts, and it brings back bad things that you don't want to remember, but once you did remember it makes you angry and you decide to defend yourself against this stuff that makes you hurt. Even if the commenter didn't mean it that way or if they they did, you don't really pay attention to the cause of it, mainly just the "Owie, I forgot about that." that happened in result. 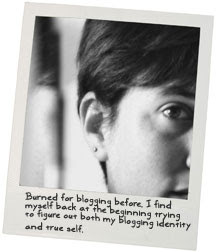 Blogging for me began at WB because it was fun. It was a burst of joy when I got pingbacks and comments every day, basically people telling me they liked me. :) Who doesn't like that? Then it became a way to release my anxiety and tension when we were TTC, after that it became a way to talk about my pregnancy and all that crap. Now it's for a lot of the same reasons Stephanie mentioned- it helps me remember. I never got into her baby book (whoops), but I updated my blog at least once a week and when there were momentous occasions. It's a way for me to tell my family what is going on with us, because my brother and his family live in Australia and don't get to see us. I started my blog to keep my family informed of our move to the 'burbs. Then about our baby. Then I went viral and there was no going back. I do it to exercise my writing muscles, I do it because some really great people comment on it (and I find places like this one!). I do it because I love being funny and entertaining people. I like reminding people of the humor in the wacky world of parenting. I've alienated a couple, I've horrified my mother-in-law on several occasions. I definitely censor knowing that I'm not anonymous. Oh, of course you are so right that it's not actually anonymous (I certainly don't write about anything that I truly need to keep secret). For me, it's just that in real-life conversations I always have my "audience" in mind, so everything gets filtered. So if I'm talking to a SAHM, I always keep in mind that I shouldn't mention research suggesting that child care arrangements often don't matter that much; and if I'm talking to a work-out-of-house mother, then I always remember I shouldn't talk about attachment theory. I'm not ashamed to think these things, it's just awkward to discuss them, you know? If I'm just a disembodied voice talking to other disembodied voices, it's easier for me to say what I think somehow. I find it a relief from the social balancing of in-person exchanges sometimes. Ah, man, I never can decide. I keep thinking about giving up my blog, but (especially as an overeducated stay-at-home mom) I always have this burning need to share any hard-won knowledge with the world. For me, the personal updates are more secondary, as a way to keep up with friends and friend-readers. In an ideal world, I'd do only really useful, resource-laden or deep-thought kind of content. Sadly, I am not sure the world necessarily cares. Plus it's a lot of work to write -- even more so for anything that actually IS the useful stuff -- and blah blah blah I never seem to decide whether to keep on or let go. I think on my first blog, I felt more like a disembodied voice. Now a days, I 'know' more of the visitors to my blog, so I don't have that luxury anymore. It makes it difficult, because on the one hand I want to write what I know. On the other hand, I can't claim total separation from my thoughts and my audience. I envy your freedom. Amen to who doesn't like comments, right?! You know, before I met my husband, when I had roommates, I categorically refused to ever have a roommate type discussion via email because there is no way to convey tone, because things can get tiresome and bogged down, rather than utilizing the cadence of true, in-person conversation. Yet - with internet friends all over the country, a meeting in person isn't always available. I will always believe that if someone were able to meet me in person and THEN read my writing, they would 'hear' totally different stories than what I write. Which is something to work on...is that the mark of a good writer? To have the written voice match the voice in person? Oh, I totally live vicariously through your travels!! I can't respond to you until you promise me never to put your kid in a carseat again without the optional, carseat-manufacturer-approved, moon-crash-landing-tested protective bubble. I like your circadian-like rhythm. Would it help to stop thinking about it so much? Probably not. I have to say, sometimes when something comes up I find it much easier these days to quickly post it as a FB post or as a 140 character tweet and move on. Back in the day, when they called Twitter the mini-blog, I didn't get it...now I do. I wonder what would happen if you blogged your tweets?